Ever have one of those wines that you just can’t get out of your head? Like you’ve tasted it several times, your mouth waters whenever you think about it, and you just can’t wait to pour another glass? Yeah, I have. And in opening my last bottle at home, I thought it was not a problem to drink the entire bottle as I recalled one more on the shelf. Of course, after I got to the store, I discovered that last bottle had been sold, and one of my staff bought it no less! It’s terribly silly…it’s nothing special even! 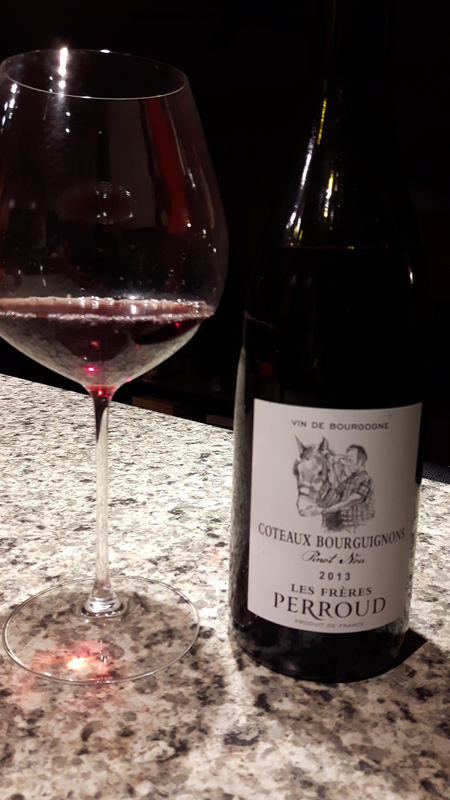 Just a simple Vin de Bourgogne that just kept calling to me, and whispered sweet nothings in my ear once I poured it into my Old World Pinot Noir glass from Riedel. I was caught up in a moment of pure deliciousness! I frantically fired off a quick email to the distributor to find out if a) If it was even coming back in, and b) When would it get here? I received my answer not long after with an indication that it would indeed be here by the end of February. Well, that was at the beginning of February, and now it is finally back! It arrived while I was in Vancouver, so I’ve only just seen it gracing the shelves in the last day. It’s already calling me, so I guess I’m gonna have to take it home. It’s like a stray puppy that keeps following me, and then looks at me with forlorn eyes…it just won’t leave me alone until I take it home. So take it home I did. This wine is made from a very tiny block in the Southern part of Burgundy in an area known as “Golden Stone”, which would actually put us…in Beaujolais. Now I know what you’re thinking: how can this Pinot possibly be any good if it’s from Beaujolais? More than just Gamay, this is truly a hidden gem from Southern Burgundy. There is a lot of “active” chalk here, giving great acidity and minerality to this wine. Not only that, there are no stems in the ferment, giving clean, low tannin, fresh wine. The oak for ageing is neutral,so the fruit and spice is the forward aroma and flavour. It is light in colour with fresh strawberries and blueberries that reminded me of summer, along with a hint of clove spice along with earth and mushrooms. Aromatic and flavourful! The bottle was emptied not long after my husband came home…Cin Cin! This entry was posted in Varietals, wine and tagged Burgundy, France, minerality, Pinot Noir, varietal. Bookmark the permalink. Sounds like yum to me! How are the studies going Luke? Slowly. I’m planning ahead now to 2017. There’s no chance for me this June but I’m going to do it anyway. Did you get your results from your exam yet? I still haven’t heard about the test that I did in November. No. Not yet. I have to redo the course work assignment which I’m kinda bummed about but whatever. Gonna re do for November. Should find out results for unit 3 next month. All the best! I know the feeling! And you saved some for your husband, very generous!